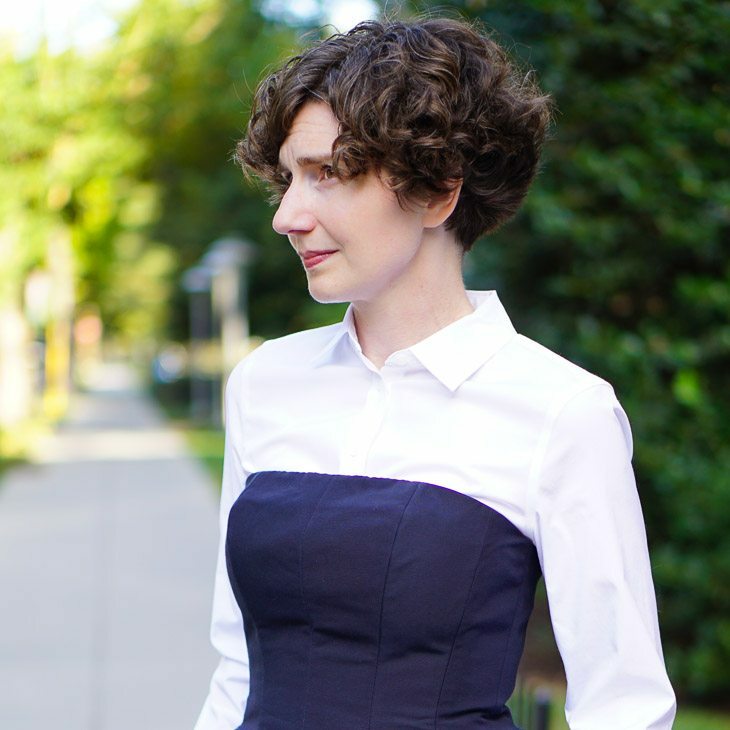 Despite wide variations in the way Business Casual is interpreted across the city, I think we can all agree that strapless tops are verboten . . . . unless you wear something over them or under them. If you wear a jacket over your strapless top, it’s no longer a strapless top, is it? But if you wear something under it — a jersey or blouse — its elegant lines can still be admired. 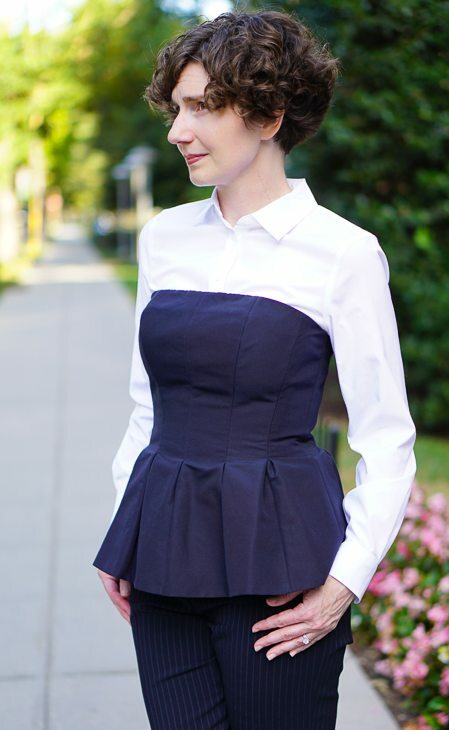 I think a blouse under a strapless top is such a great look — feminine and edgy at the same time — and this navy blue top is just the thing to enliven a pair of navy pinstriped pants and a white blouse. If you’ve seen the remake of The Thomas Crown Affair, starring Rene Russo and Pierce Brosnan, you may remember that Ms. Russo’s character has the most beautiful wardrobe. When she comes to take charge of the NYPD war-room that is investigating a brazen art heist, she is wearing a three-piece pinstriped suit that appears fairly traditional, until she takes the jacket off to reveal that the vest is, in fact, a bustier. If you haven’t seen the movie, you may want to watch it just to see her clothes. It is a Good Movie for Clothes, in company with A Perfect Murder (which I actually think is a pretty good movie, though a shadow of Dial M for Murder), Rear Window (which is not only an excellent film, but has transcended its era and remains relevant to current fashion), You’ve Got Mail, and What Maisie Knew. The genius in this bustier, by Rebecca Taylor, is a little stretch; these tops need to fit snugly, but one must be able to breathe. In all candor, I do wonder if this look isn’t a little excessive, a little too glam, for the office. Ah, who cares? I mean really, who cares if I am bizarrely overdressed for work? No one. I have, however, elected to keep the accessories quiet. Black patent flats, a glossy blue tote, and a simple watch on a black alligator band. I’ve worn this bustier a little differently on casual Friday — with a tissue-weight navy tee shirt underneath, dark rinse jeans, black flats, and a rhinestone and mixed metal multi-strand necklace. This is fantastic! I love this look Directrice. You look just fabulous. Brilliant. I love this look and I agree with you on Rene Russo’s clothes in The Thomas Crown Affair…timeless…I’d wear any of them today. Haven’t seen the othe movies except Rear Window and Grace Kelly’s wardrobe was beautiful in that movie. I’ll have to check the others out! Lovely. I’d also like to see how you wore the bustier on casual Friday. Love how you push the edge of law firm wear – brilliant! And giving me ideas for a highly needed suit update myself. I love The Thomas Crowne Affair with Rene Russo (actually tried to watch the original and was pretty disappointed, though Faye Dunaway had a pretty great look of her own) — and agree her wardrobe in that is stunning — though I always fear for her gorgeous, high-necked white coat that she wears with dark red lipstick — but of course someone like that does not smudge. The proportions are lovely – I have to mimic this look! I’d even go with a navy pencil skirt. Very inspiring Directrice! Keep ’em coming!